Welcome to Forecast! 🙌 If you read this article, your organization probably just signed up for Forecast. Forecast is a Professional Services Automation (PSA) tool for Project & Resource Management. This article will focus on everything you need to know as a Manager or Controller in Forecast. We chose to keep Managers and Controllers in the same article, since views and permission levels are almost the same. The only difference is that a Controller also has access to financial information, i.e. create and edit rate tasks and budgets, and view overall financial information for the organization. The first view everybody gets when entering the Forecast system is the Upcoming Work. Upcoming Work is your personal prioritized to-do list of work. In other words, all the tasks you're assigned to. Tasks live in columns on the Workflow board in each individual Project. The Upcoming Work page gathers all of your work across projects, and sorts it into Overdue, This Week, Next Week, Future, and All. You can return to your Upcoming Work at anytime by clicking the logo at the top left. First, before we dig into your workflow as a Manager or Controller, we have a few terms we want to introduce you to in order to understand Forecast. We also have our Product Tour taking you by the hand when you first enter the system. We refer to this for a basic first-hand interactive experience. If you're not already assigned to a project; the first step you'll see is to create your first project. A project contains various tabs that we will get back to later. The project portfolio is found in the Projects tab in the global top menu, along with the other important sections, i.e. Time, Scheduling, and Insights. These terms should hopefully be self-descriptive, but the Time tab takes you to your personal time registrations, and as a Manager or above also the ability to view other team members' reported time. The Scheduling tab is where you do resource scheduling, you allocate people to projects, you find and book available workforce, and in general manage and view what people are allocated and assigned to. Insights is the last tab, and this is where you create and find your live insight reports. You can create as many as you'd like, and even share them with your stakeholders. Tasks can contain a lot of information, e.g. description, to-dos / subtasks, comments, files, estimates and time reported on the task. Tasks are created from the Scoping page within your individual projects, and during daily work go through the phases in the project's Workflow. Phases in Workflow are visualized as a Kanban board with columns. There are three types of columns, i.e. to-do, in progress, and done. You can only have one to-do and one done column, but you can have as many "in progress"-columns as you want. The Workflow is probably where most of your Collaborators will spend most time. Scoping, as mentioned earlier, is where tasks are created. This is basically your Statement of Work (SOW). You create new Milestones for your project, and add tasks inside of each milestone. Milestones have a title, and a start- and end date. Tasks inside the milestones are defined with a title of the task, a main role, e.g. Software Developer, and a low- and high estimate. Based on this information, our AI engine will generate a more precise time estimate, seen as Forecast, and a Price for the card based on the Forecast estimate, the rate card selected for the project, and the role specified for the card. When you're ready to publish the tasks to your team, you simply approve individual or all tasks at the right. 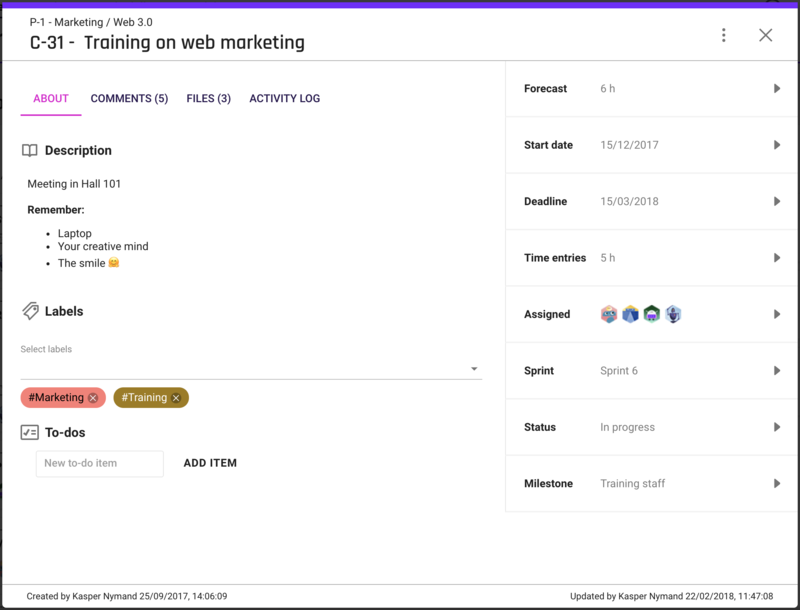 If you work in Sprints (Agile with Scrum), the tasks will now be taken to the Sprints tab, otherwise the task will go straight to the Workflow for your team to see. In the case of Sprints, you have your usual Backlog of tasks, and each Sprint you've created. You prioritize the backlog by dragging tasks up or down, and likewise move them to the Sprints. Once this is done, the task will show up in the to-do column in Workflow. Other tabs found in your projects are Timeline for an interactive Gantt chart, Budget for your live budget, Team to manage the project team, Client to select and store information on the project client, and finally the Rate Card attached to the project. Maybe you're already a bit familiar with the basic navigation by now, but we still want to spend some time explaining it to you. Basically, we have two global menus, the navigation menu at the top left. Upcoming Work (logo), Projects, Time, Scheduling, and Insights. At the right you find the three global elements; your personal menu, named after you, the universal Create button, and the Timer. Your personal menu takes you to My Profile with settings related to your personal Forecast account, the Help leading to our Help Center, Shortcuts for keyboard shortcuts, and finally the ability to Log out. The Create button lets you create new projects, tasks, connected projects, clients, and insights. Next to your personal menu, you find the Timer. This is an optional feature, but it's basically a stopwatch that you can use to track time, and use the dialog afterwards to report time on a task. You can manage the timer in real-time across both the Web App and Mobile Apps. Start on your laptop, and report on your phone. The first page presented to you when creating a new project is the Scoping tab. Here, you setup Milestones, and add tasks to each milestone. You define the title and dates for the milestone, and the title, role, and estimates for each task. When done, you approve them at the right to move them to the Workflow for your team to see. If you work in Sprints, move on to the Sprints tab, to manage the Backlog, prioritize tasks up or down by dragging, and moving them to your created Sprints when you're ready. In the case of Sprints, this is when the tasks show up in the Workflow. To begin utilizing the strengths of Forecast, you need to select a Client and a Rate Card for the project. You can either select an existing item, or create a new one. Also, adding your team members in the Team tab invites everybody to collaborate on the project. This data is all used to generate the budget. Only relevant for Controllers: Moving on to the Budget. You'll now already see an automated live budget generated for you. 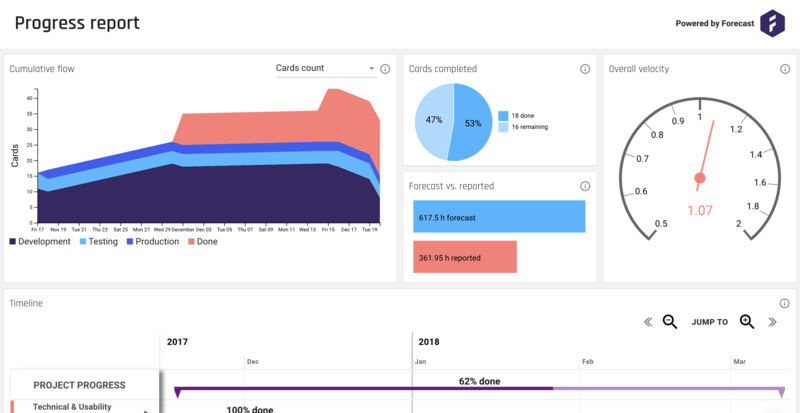 This data is based on the reported hours on tasks by your team, the roles of each card, and the rate card selected for the project. Each team member has a Main Role. 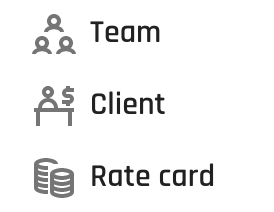 Each project has a Rate Card with values for each role. Each task has a Main Role assigned to them in Scoping. These are all connected. Optionally, you can add a Fixed Project Price on the budget if you work with a fixed price, or otherwise keep it empty if not. You'll see the Project Totals below the chart, any additional added Expenses, and the financial information related to each Milestone. Forecast has also made it easy to export budget data to a .CSV file with the click of a button. Just click the download button in the upper right of the budget. 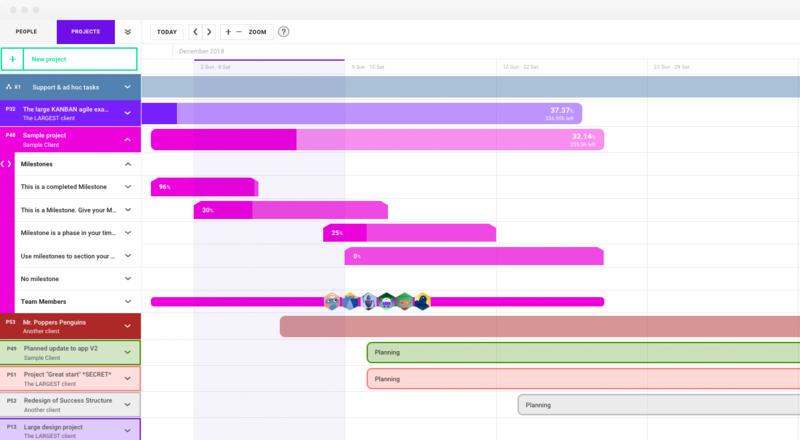 Using the Timeline tab gives you an interactive Gantt-like chart of milestones and tasks in the project. You can change dates for milestones simply by dragging it along the timeline. Similarly, you can extend or shorten milestones and tasks by dragging the edges. Workflow, as we've touched upon earlier, is where most of your team will manage their work in Forecast. Opening and editing tasks, moving tasks as it progresses, and getting a better perspective on the current work. You can add, remove and edit columns to customize your workflow. The last important tab you see in a project is the Overview. This tab is only visible to Managers and above. Overview, as the name suggests, is there to give you a quick overview on your project. This is especially useful if you manage several projects, and don't have the time to dig deep into each one of them. It lets you change the project dates, the project stage, the project status with notes, and the project contact person. Additionally, you can see the current capacity, whether you're ahead or behind, and status of the current sprint if you've enabled Sprints. Below, you'll see a timeline of milestones and people. Here you can also use the "Quick Book"-feature, similar to in Scheduling as we'll get to later. Moving to the next main tab in the global top menu, Time. Time is where you report time for yourself, and additionally as a Manager or above you're able to view and manage time entries by your team members. Time entries do also have an optional notes feature that lets people add a note to a time entry if any information needs to be added. To report time, you simply select the project and the task in the dropdown menus, and type in the number of hours. To view another team member, use the dropdown menu above. If you wish, you can also report time directly from an open task. Just find the task you've been working on, open it, expand the Time entries tab at the right, and type in the number of hours you want to register. Scheduling is where you as a Manager or above is able to allocate people to projects. Collaborators will only be able to view their own schedule in this tab. Scheduling has two views, the People view and the Projects view. These basically show the same thing, just from a flipped perspective. People allocated to projects, or projects allocated to people. Additionally, you're able to switch between seeing Allocations or Tasks from the People view depending on how granular you want to go. Doing proper pre-planning in scheduling is possible two ways. Either you use our "Quick Book"-feature to get an automated list of available people, based on what role you need, for which project, and which time span. The second option is to use Virtual Users to plan and reserve demand in the future. Go to your Admin Settings, and create new Team members. For instance, have a "Senior Developer"-virtual user, label it "backlog", and add the "Senior Developer"-role to it. Schedule the virtual user for the future in Scheduling. Now, you can see future needed allocations using the label filter "backlog", and the role "Senior Developer". If you want to see if anybody is available in that space, just remove the "backlog"-label, and you'll see all of your Senior Developers together with the needed allocation. Book the person who's available. Maybe slightly move previous or upcoming allocations for the person, if necessary. Insights is the last tab in the main menu. Based on all the data you put into Forecast, you can create insight reports featuring various insight components. There are four types of insights available, i.e. Projects, People, Business, and Portfolio, each with their own set of components. You can create as many insights as you'd like, and you can always add / remove components to them afterwards. Reports are shareable using a unique link, and kept secure with a generated password. If you ever lose control of the link and password, you can always stop sharing the report, and the link will be broken. Next time you share it, a new unique link and password will be generated. Some interesting components for a Controller are the People to see Cost per Team Member, Reported Time, Utilization and financial information. Cross project planning and execution is possible by adding projects to a Connected Project. A connected project contains directly linked projects, and gives a connected overview of the progress. You find the option by clicking the universal Create button. As a Manager and Controller you're able to connect the projects you're assigned to. Being able to duplicate projects is a small, but very significant feature. This is a great time saver if you're working with many similar projects. 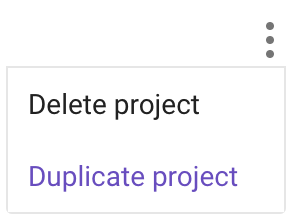 Duplicating projects makes it possible to set up project templates, keep them in the Halted stage, and then duplicating them every time you need a similar looking project. Saving you the hassle of mirroring projects over and over again. Duplicating a project is easy. Just go to your Project Settings, click the Options icon in the upper right-hand corner, and select Duplicate project. The following window lets you choose what data to keep in the duplicated project (e.g. your template). Your duplicated project will be created. 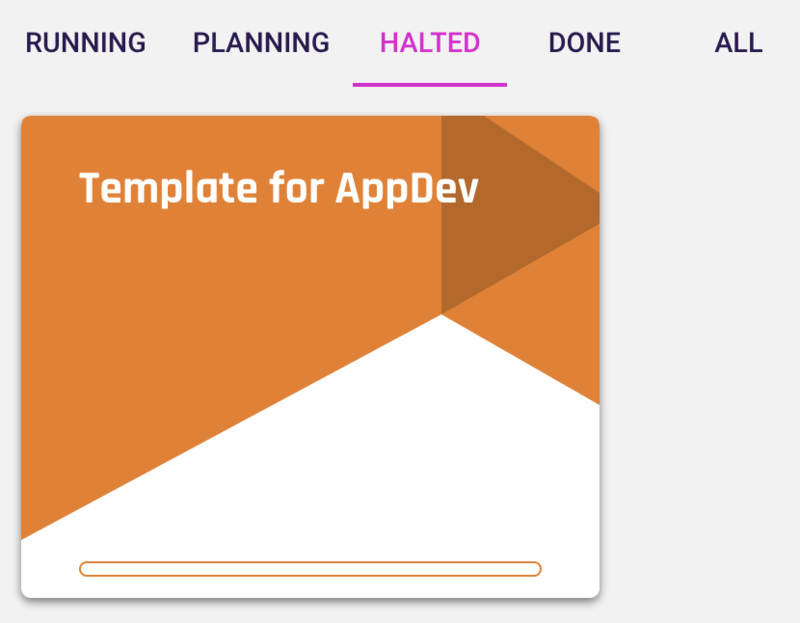 Name it something like "Template for AppDev", and set the project stage to Halted if you're creating a template from an existing project. If you're duplicating an already created template - simply name it the project name as usual.